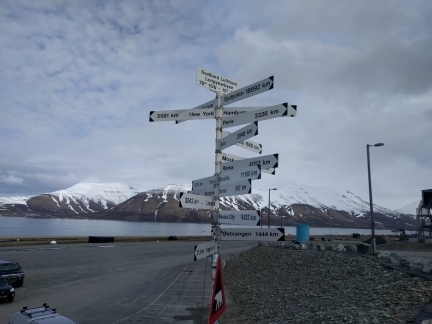 Svalbard, lying 600 miles from the North Pole, is about as far north as a person is likely to get without being a polar research scientist. 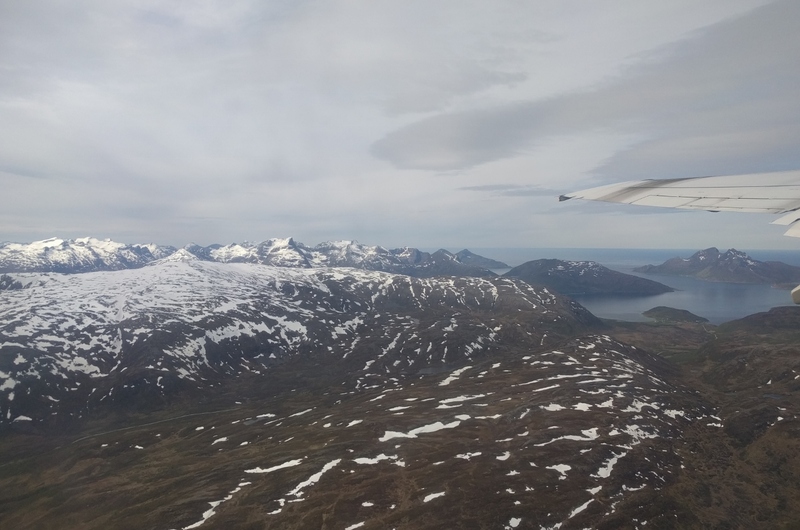 Despite the thousands of visitors who arrive annually in cruise ships and by plane, the area still has a real wilderness feel. The scenery is spectacular, with little evidence of human impact. 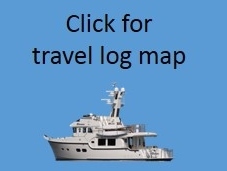 These features also draw a few dozen pleasure craft 450nm across the Barents Sea each year, taking on the poorly-charted, ice- and log-infested waters where the weather can change rapidly with little warning. 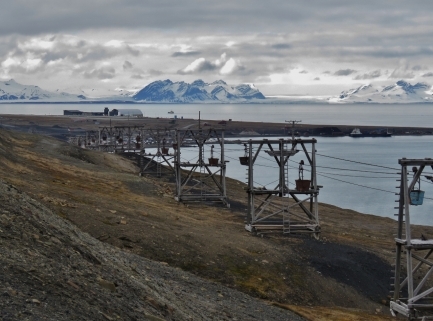 Svalbard’s natural resources have long been exploited, particularly coal mining, trapping and whaling, with several countries vying for control. 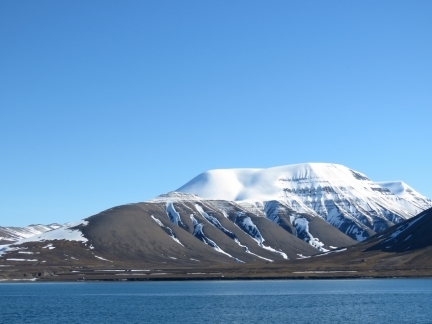 A 1920 treaty established Svalbard as Norwegian territory, but gave citizens of the 46 signing countries the right to live and work there without restriction or visa requirement. Hence the territory has two Russian mining towns: the now-abandoned Pyramiden and the still-operating Barentsburg. The main settlement in Svalbard is Longyearbyen, with a year-round population of just over 2,000. The few other scattered settlements bring the total population up to around 2,500. 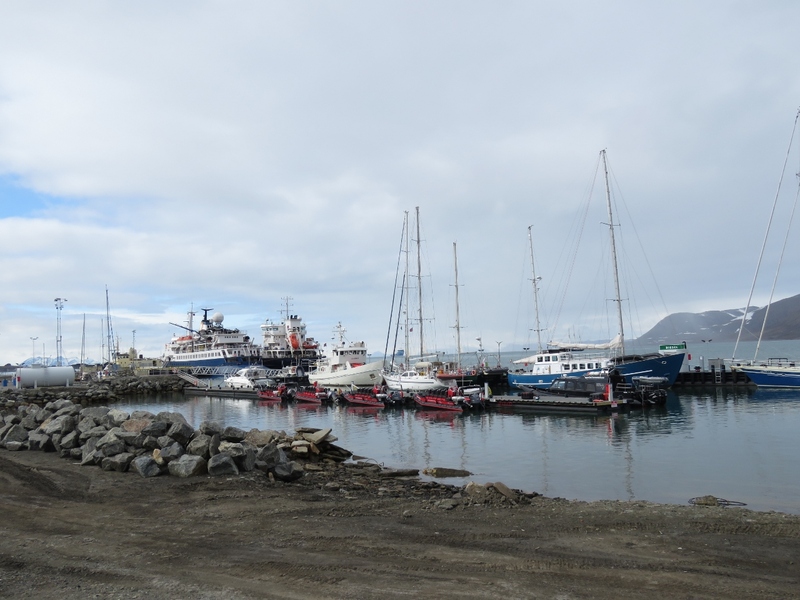 Longyearbyen has all the modern amenities and several good restaurants, but still feels like a frontier town. 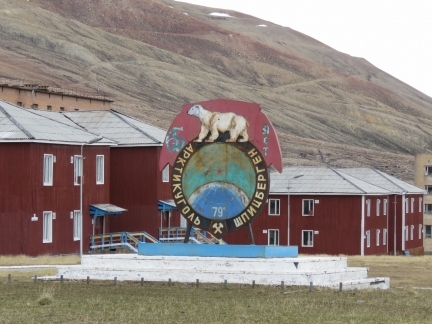 Polar bears in the region number about 3,000 and attacks are such a danger that the authorities require anyone visiting to carry a rifle when moving outside the settlement. 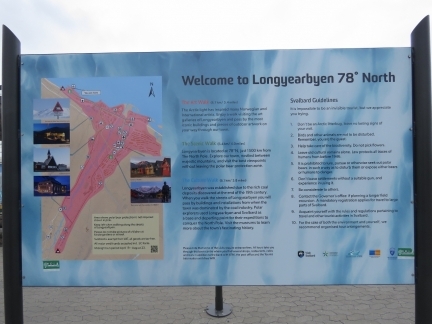 Maps of Longyearbyen show a pink safe area, and road signs warn when leaving that zone. 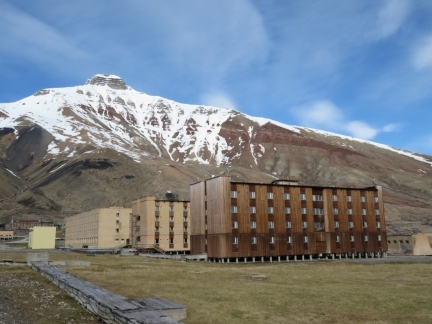 The excellent British TV series Fortitude is set in Svalbard and gives a reasonably accurate depiction, although without all the tourists. 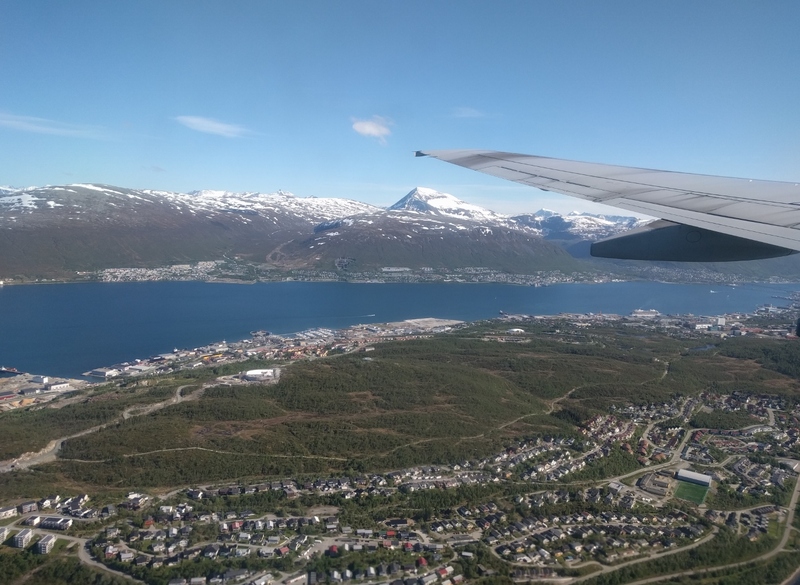 From Tromsø we took a 95-minute flight to Longyearbyen and spent three nights there. 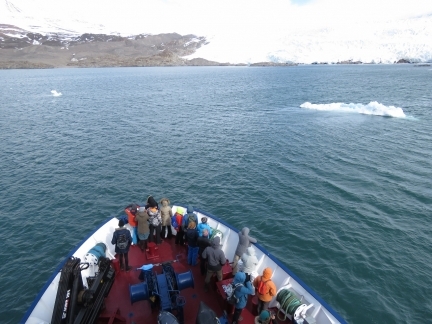 On our first full day, we took a cruise to the spectacular Nordenskiöldbreen Glacier and the Soviet-era mining town of Pyramiden and on the second did a late-season snowmobile tour to Longyear Glacier. 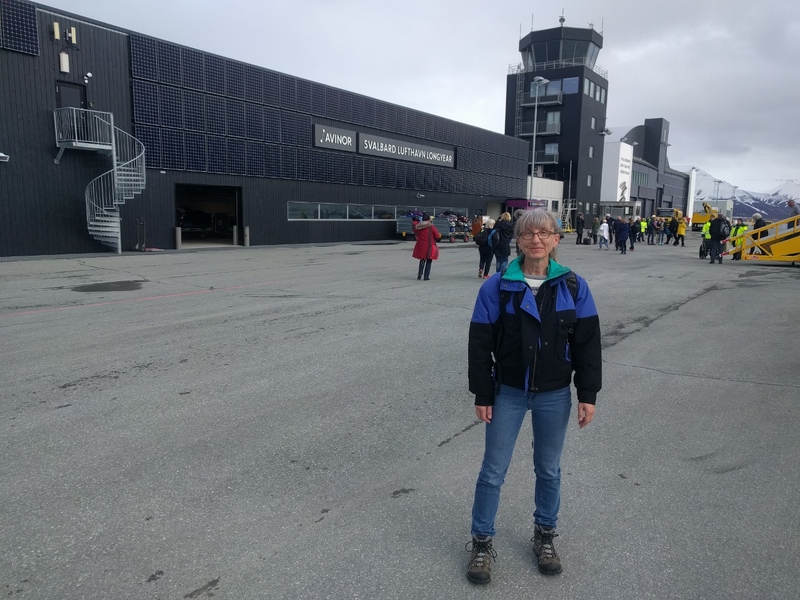 And in between we walked all over Longyearbyen, including visiting their two museums and tasting a pint at the world’s most northerly brewery. 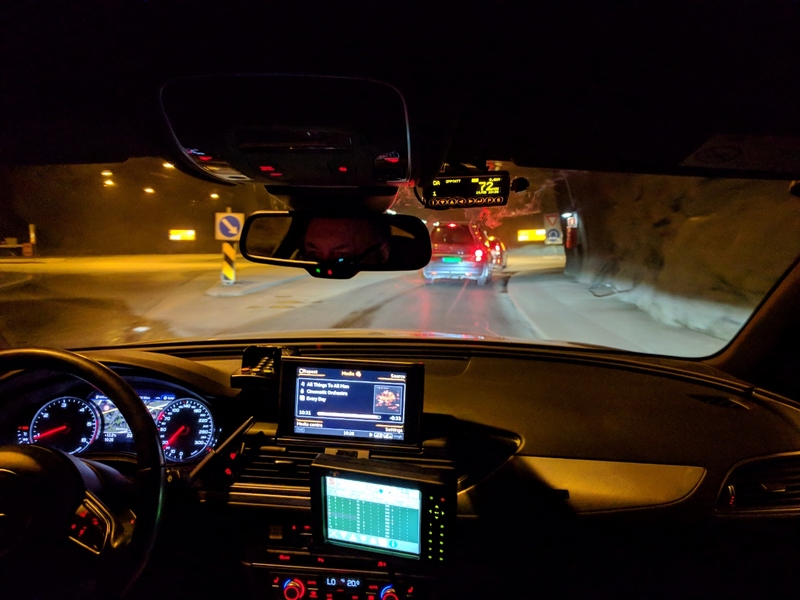 Taking a taxi to the airport through Tromsø’s extensive tunnel system. 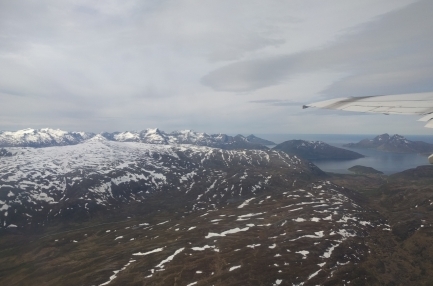 Looking across 2,591ft (790m) Kjølen on the island of Kvaløya shortly after take-off from Tromsø airport. 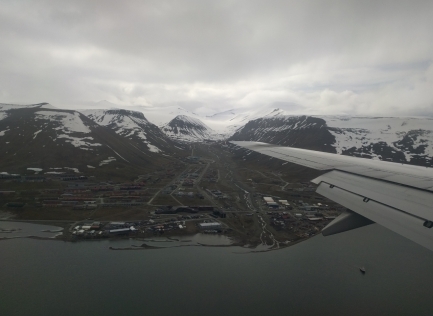 Barely an hour after taking off from Tromsø, we got our first view to Svalbard at 76° 48′ 13N. These ice floes are off the southern tip of Spitsbergen. Looking south across our destination, Longyearbyen, the main settlement on Svalbard at 76° 48′ 13N. A happy Jennifer on the ground at Svalbard. The fingerpost at the Svalbard airport shows we’re only 813 miles (1309km) from the North Pole. Tradition in Longyearbyen is that you remove your shoes before entering many buildings in town. This dates from the town’s coal-mining past where miners were expected to remove their coal-dust-encrusted boots. 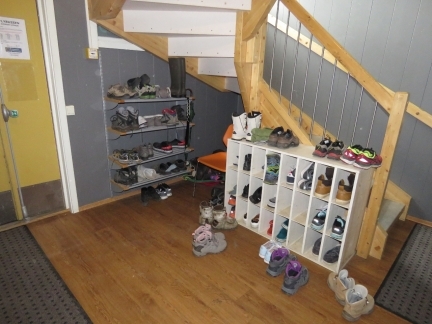 As traditions go, this one is rather annoying, as the floors aren’t very clean in most places and our socks get quite dirty as we walk around inside. 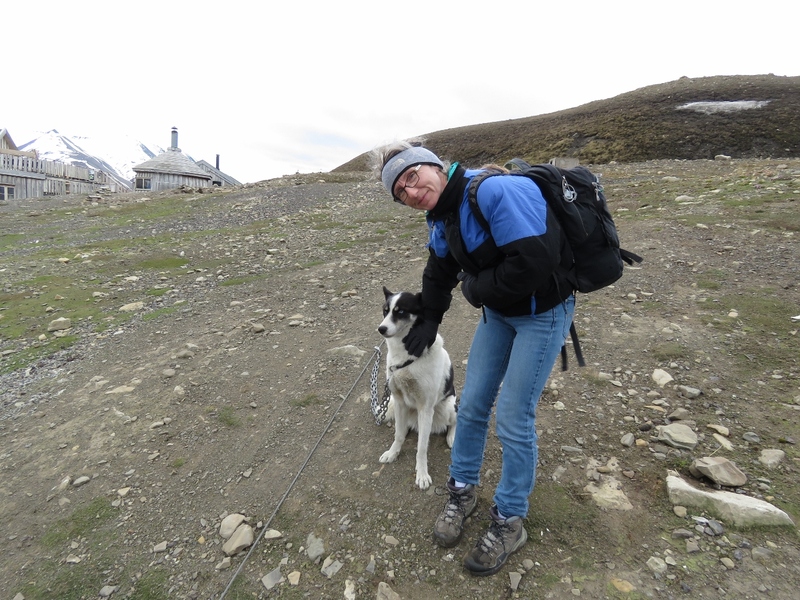 Were we to visit again, we might carry some cheap lightweight slippers. 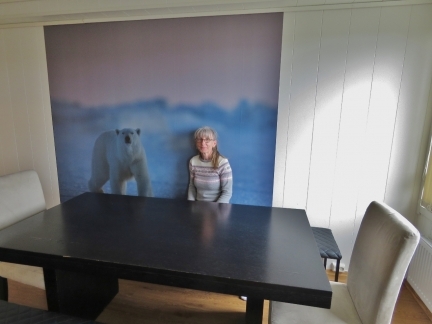 Polar bear sightings aren’t particularly common on Svalbard, but at least we see one every day in our room at the Svalbard Hotel. Tracked vehicles belonging to UNIS (University Centre in Svalbard), an Arctic research organization that also provides university-level courses. In the winter, tracked vehicles, particularly snowmobiles, are the main form of transport. After checking into the hotel, we visited the North Pole Expedition Museum detailing the various expeditions to the North Pole, particularly in airships. 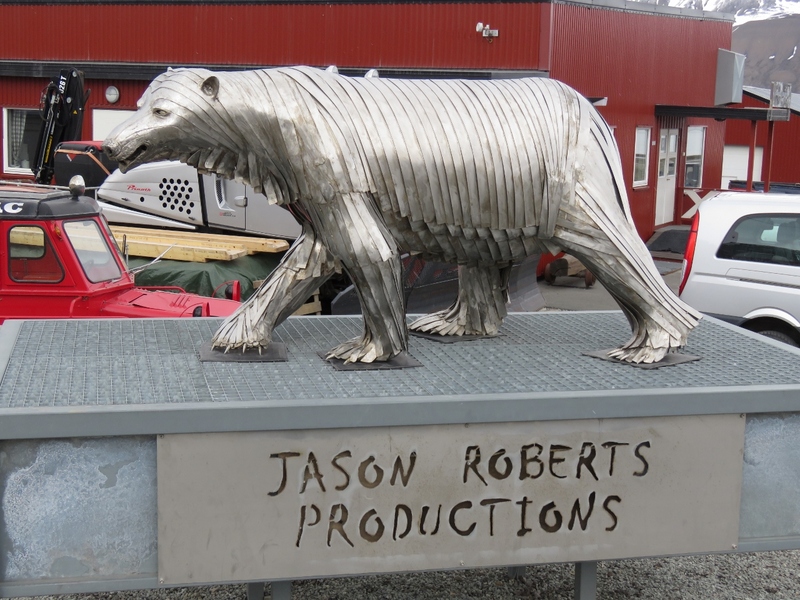 A beautiful metal sculpture of a polar bear outside Jason Roberts Productions. Australian Jason Roberts, aka “Mr. Polar Bear”, has operated a film production company in Svalbard for the past 20 years specializing in Arctic filming. He’s supported productions such as BBC’s Planet Series and the James Bond film Die Another Day. Modern coal mining began in the Longyearbyen area in 1906 and over the years has operated in several locations. Cableway central was built to transport coal from the various mines to the harbour, with three cableway arms on the left and one on the right. 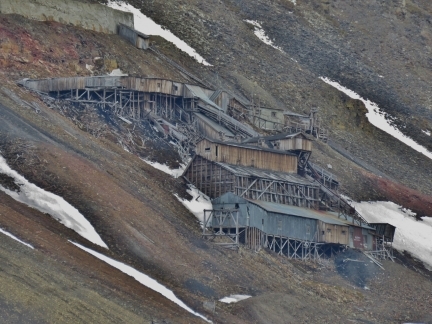 The cableway was abandoned in 1987 and trucks transport coal from the one mine that still operates. 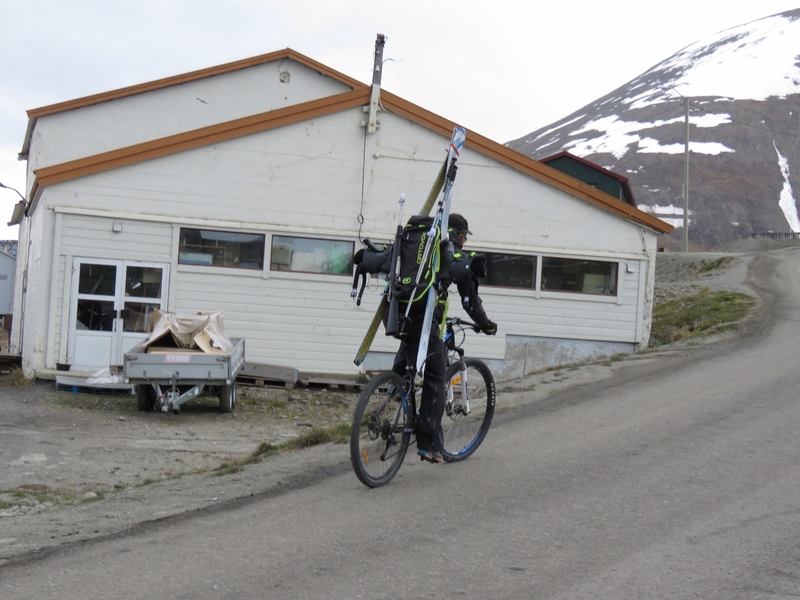 An unusual combination of a cyclist carrying skis and a rifle. Well, its unusual for us, but not for Svalbard. 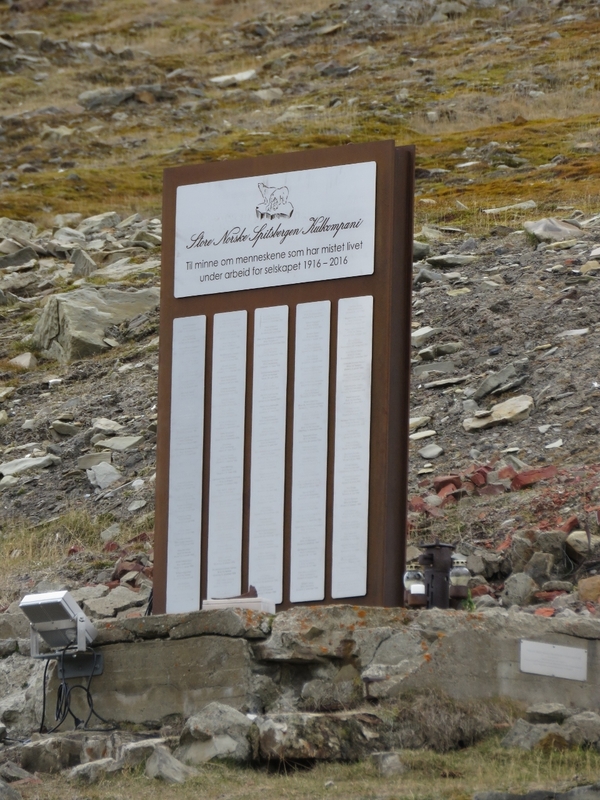 Anyone leaving the town limits must carry a rifle in case of a polar bear encounter. 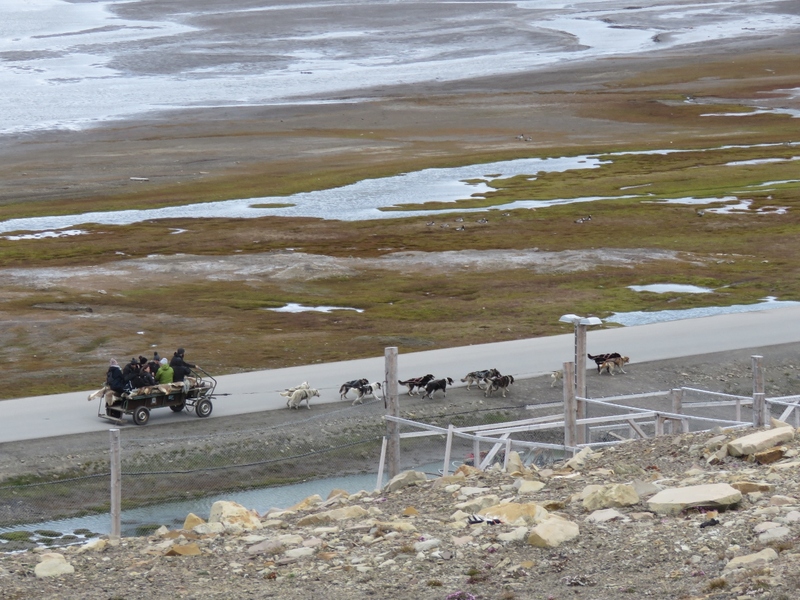 Dog-sledding trips are popular winter tourist excursions and beautiful Huskies are common in Longyearbyen. Looking northwest across the Port of Longyear, with a mix of pleasure craft, tour boats and large commercial boats. 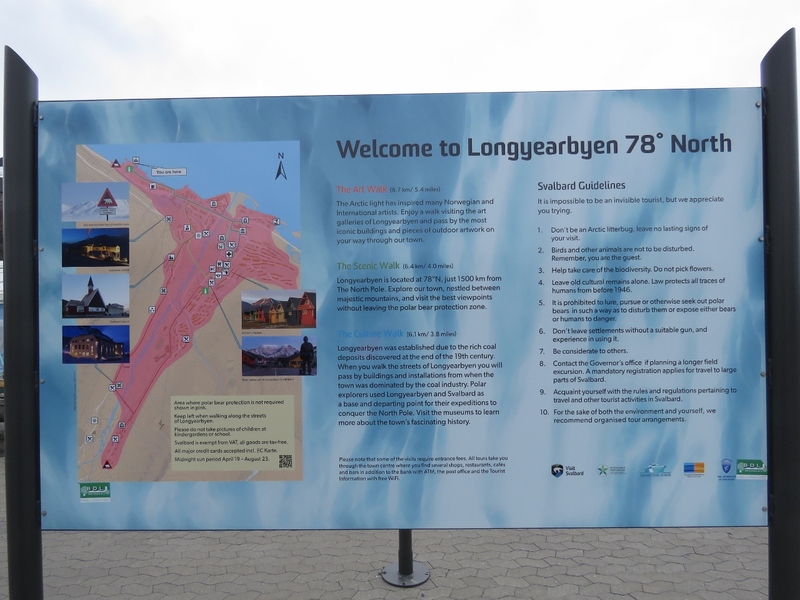 When we arrived in Longyearbyen we were given a copy of this map, shown on a signpost near the harbour. 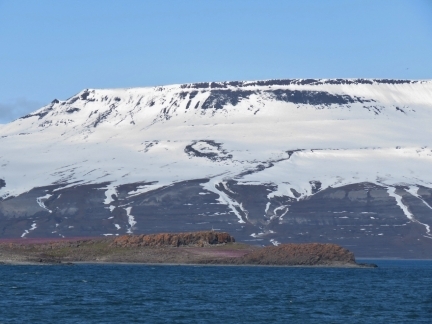 The pink areas are where polar bear protection is not required. Outside the pink areas, a rifle is the government-recommended form of protection. 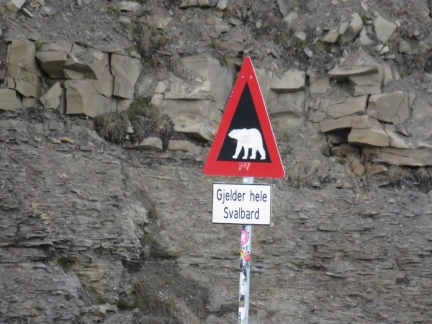 Polar bear warning sign at the edge of the safe area. 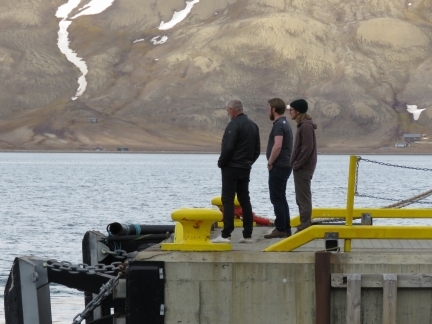 We’re bundled up in ski jackets and this man is standing on the dock with only a T-shirt. 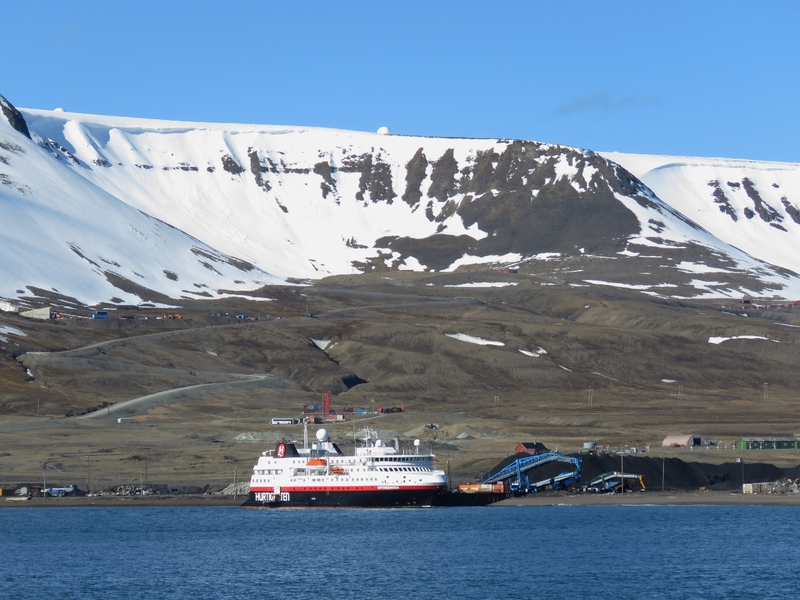 The 344-ft (105-m) pocket cruise ship Expedition that we saw while looking for whales off the northern tip Andøya. 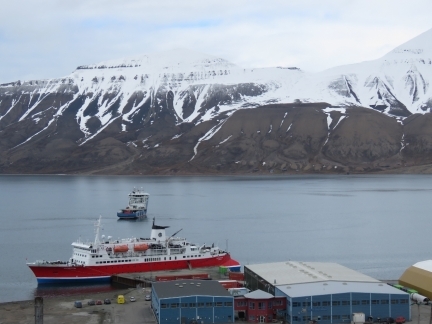 Moored offshore is the fire-fighting and rescue vessel Polarsyssel, built in 2014 for the Governor of Svalbard. Abandoned coal carts looking west from Cableway Central. 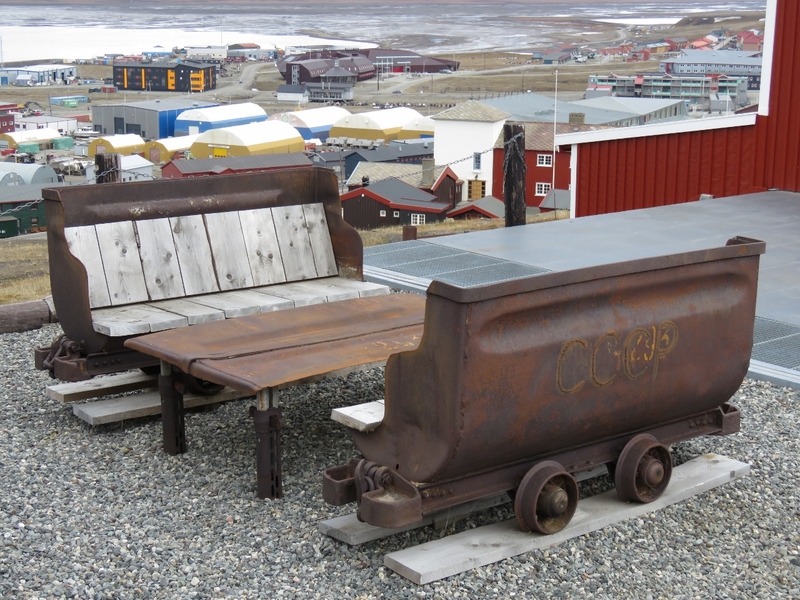 We loved this patio table made out of an old mining cart. 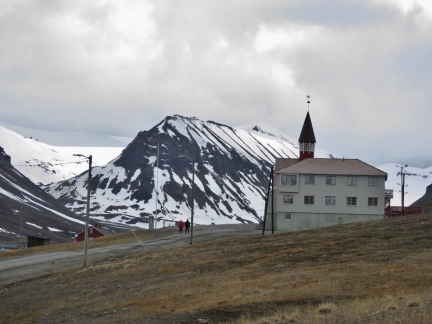 The Svalbard Kirke (church) was built in 1920 and rebuilt after World War II German bombing destroyed it. Local tradition is to start a week-long celebration of the end of winter when the first rays of sunlight hit the forehead of someone standing on the steps. 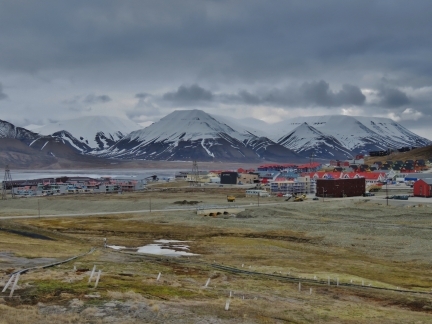 Looking northeast across Longyearbyen with fabulous mountain scenery beyond. The town has a real frontier, just-been-built look and feel to it. 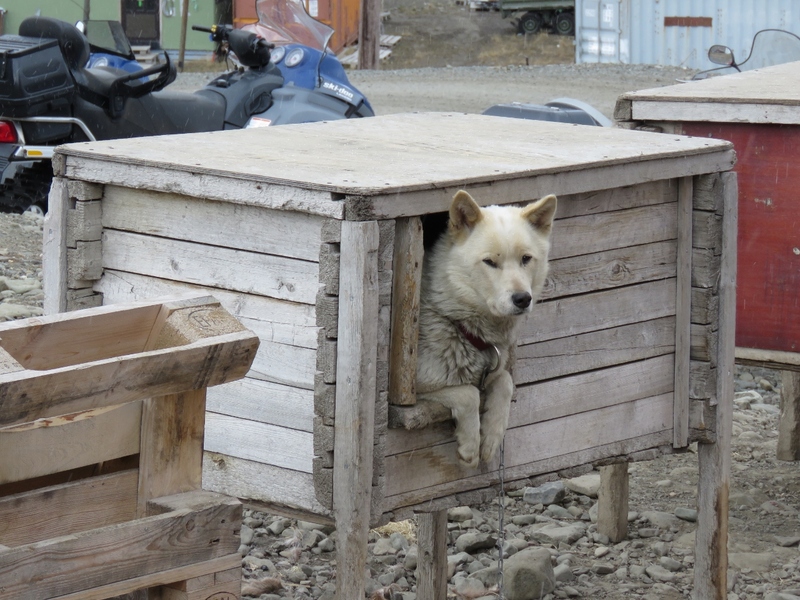 Because of the permafrost, all buildings are constructed above the ground and, what’s more unusual, all the sewage and water piping running throughout town also is above-ground. 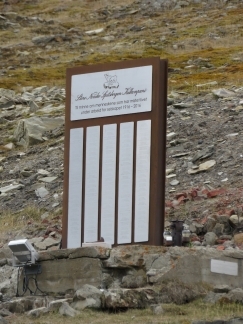 A 2016 memorial to those who died working in the Longyearbyen mines in the past century. 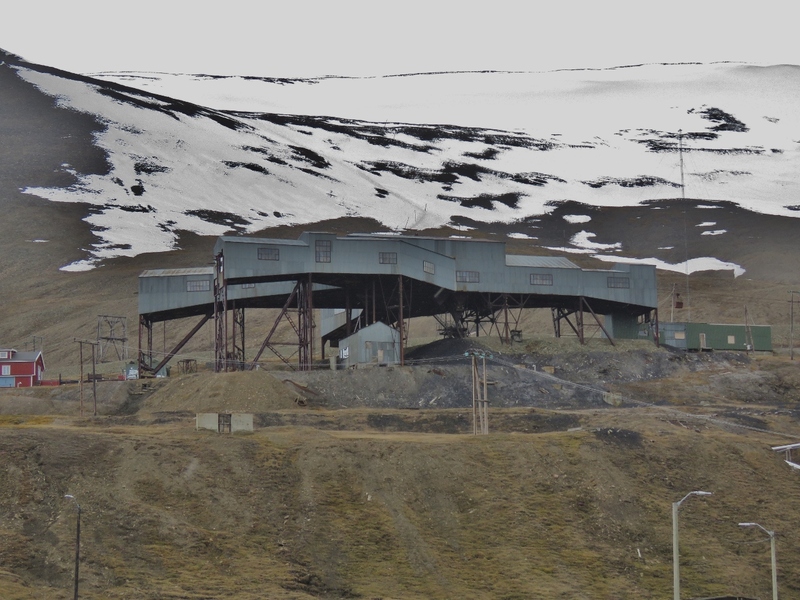 The ruins of Mine No 2 in the hills east of Longyearbyen. 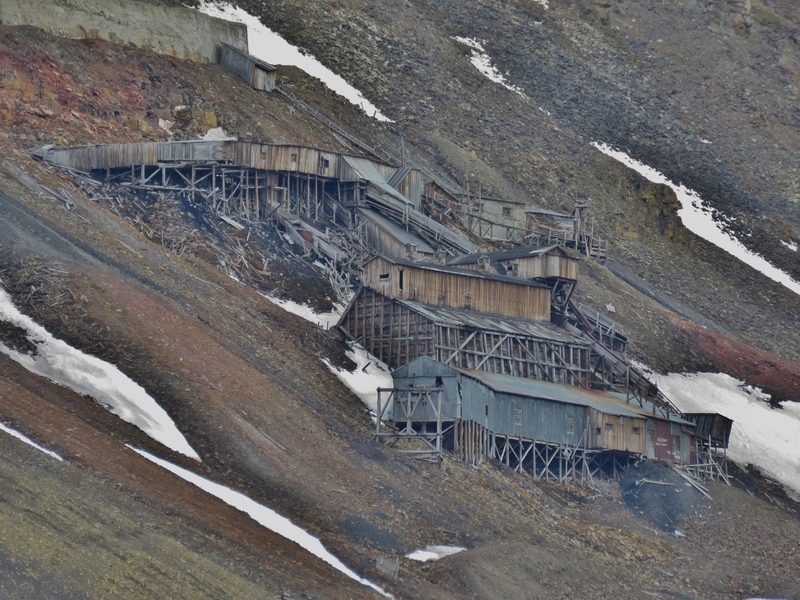 When the Germans bombed Svalbard during World War II, the mine was set alight and burned for 14 years. It’s known as the “Santa Claus Mine” because locals tell their children that Santa Claus lives there. 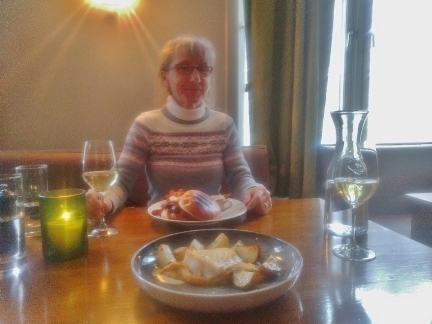 We had an excellent meal at quirky Kroa. The pub/restaurant is built from salvaged material from the Russian mining town of Barentsburg, Svalbard. 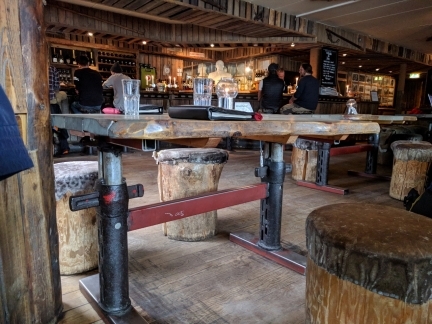 A large white bust of Lenin visible behind the bar and the tables are made from the jack-stands used to hold up mine shaft roofs. 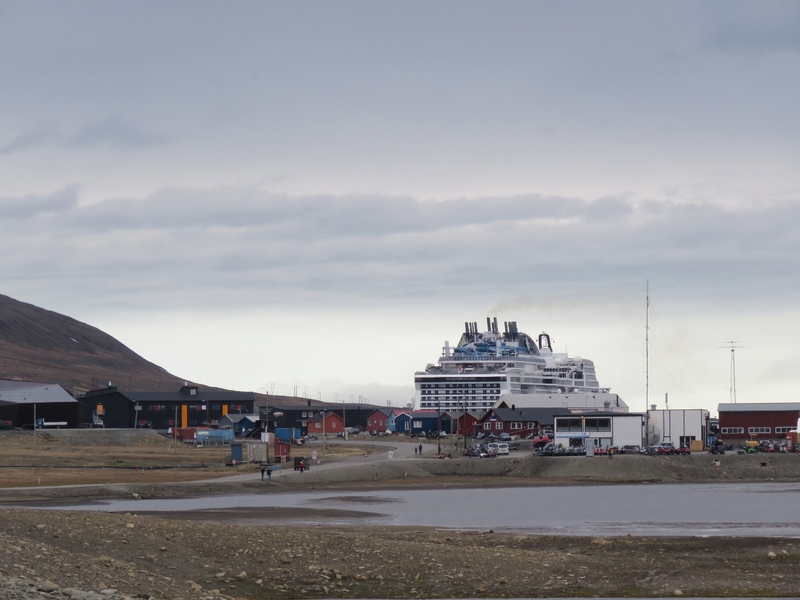 The Hurtigruten Spitsbergen docked at Longyearbyen. 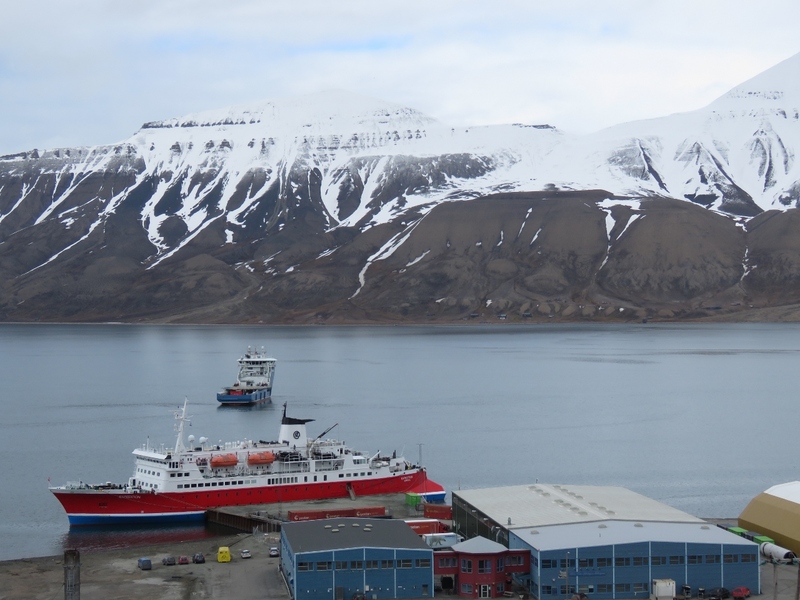 We’re underway on the Henningsen ship Billefjord for a cruise to Pyramiden, an abandoned Russian mining town north of Longyearbyen. We’re lucky to have such a beautiful clear day for our cruise. The mountains all around look fabulous. 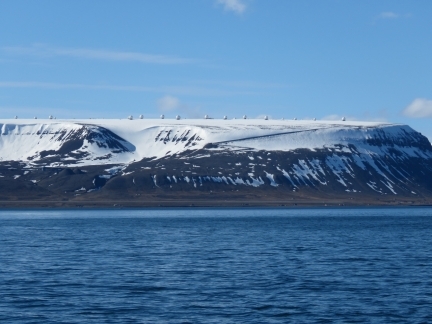 The Svalbard Satellite Station is the only one of two stations that can see low-altitude polar orbiting satellites on every earth revolution. 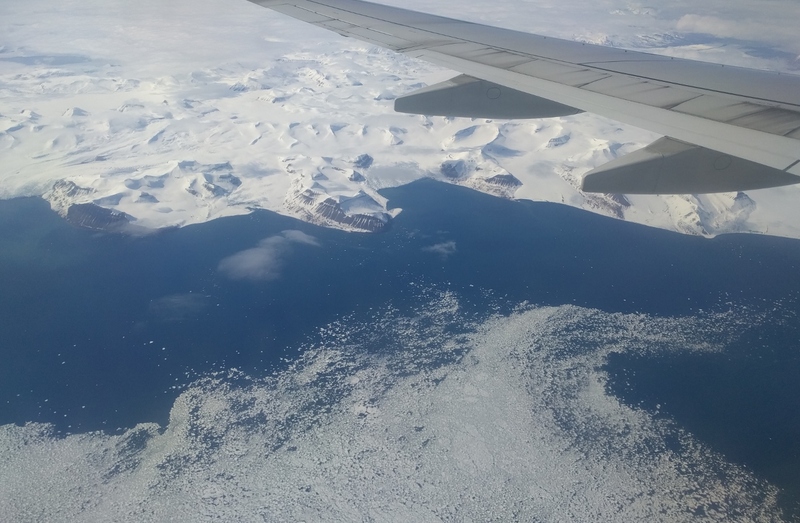 The other is in Antarctica. 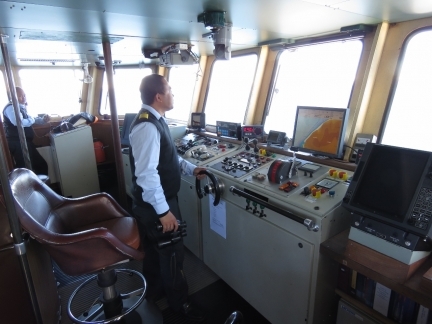 In the wheelhouse of Billefjord. 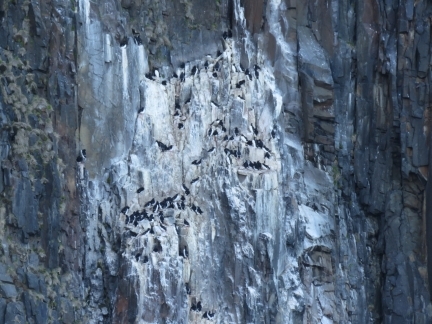 Brunich’s Guillemots nesting in the cliffs at the mouth of Sassenfjorden. 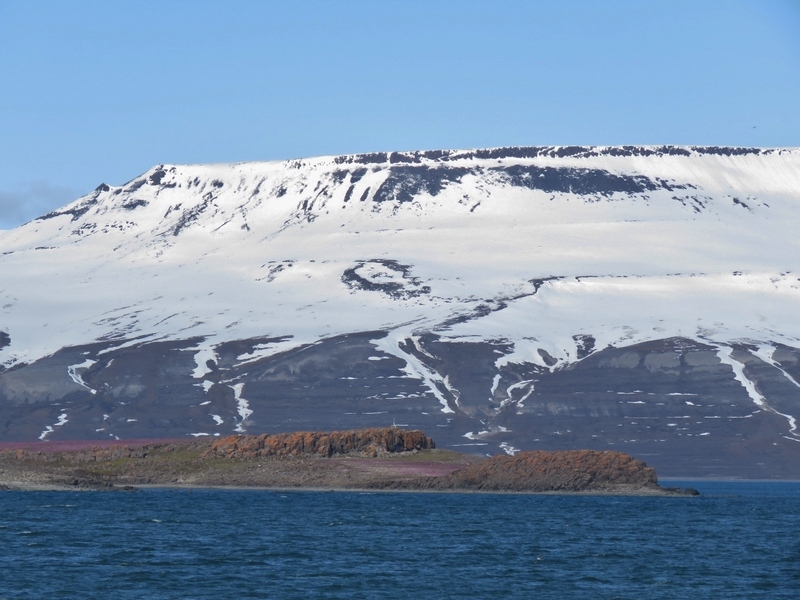 The weather in Svalbard is so harsh that not much grows here, so this small offshore island covered with pink wildflowers stands out. The spectacular Nordenskiöldbreen Glacier at the head of Billefjorden. The captain brought the Billefjord close to the glacier, working his way carefully through the bergy bits. Enjoying a glass of whiskey with glacial ice from Nordenskiöldbreen Glacier. 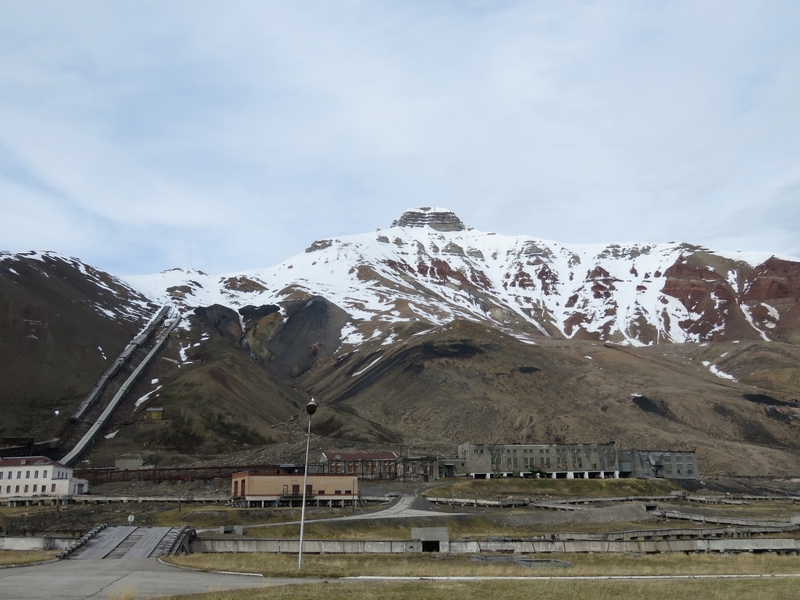 The abandoned Russian mining town of Pyramiden dwarfed below snow-capped peaks. 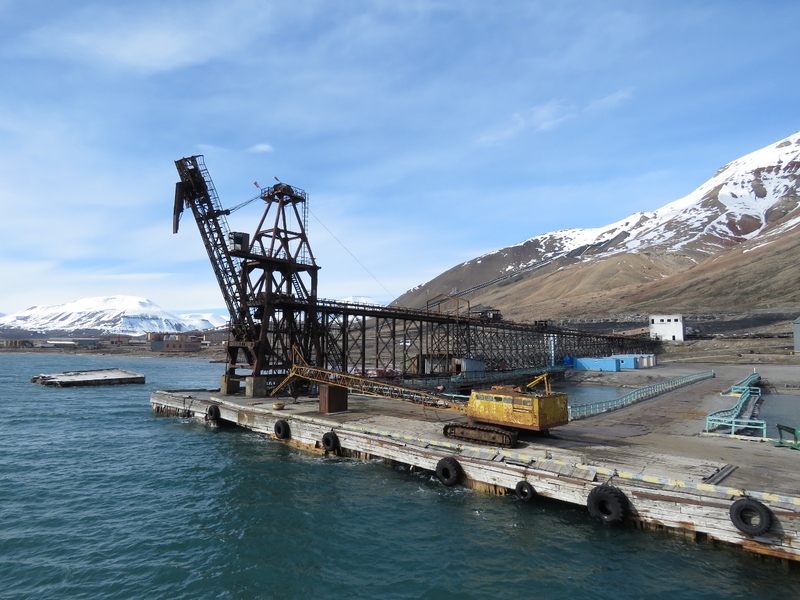 The old dock looks a little tired, but still is serviceable. 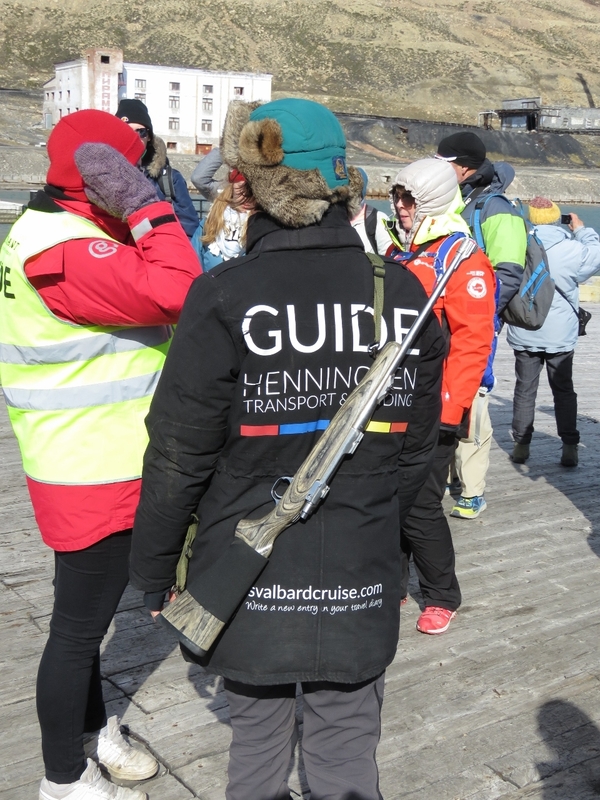 While a local guide (left) takes us on a tour of town, our Henningsen guide brought up the rear carrying a rifle and keeping a watchful eye. 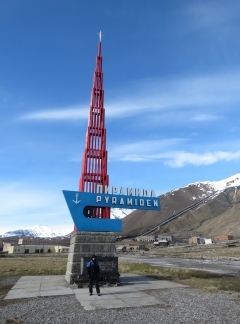 Jennifer standing beneath the Pyramiden monument. The 1920 Svalbard Treaty established Svalbard as a Norwegian territory, but made it a visa-free zone where citizens of any country are allowed to live and work. A mining company owned by the Russian government has been mining in Pyramiden for decades and the Russian population reached around 2,500 in the 1950s. The settlement was abandoned after mining ceased in 1998, when the coal yield was no longer sufficiently profitable for Russia to continue subsidising the operation. 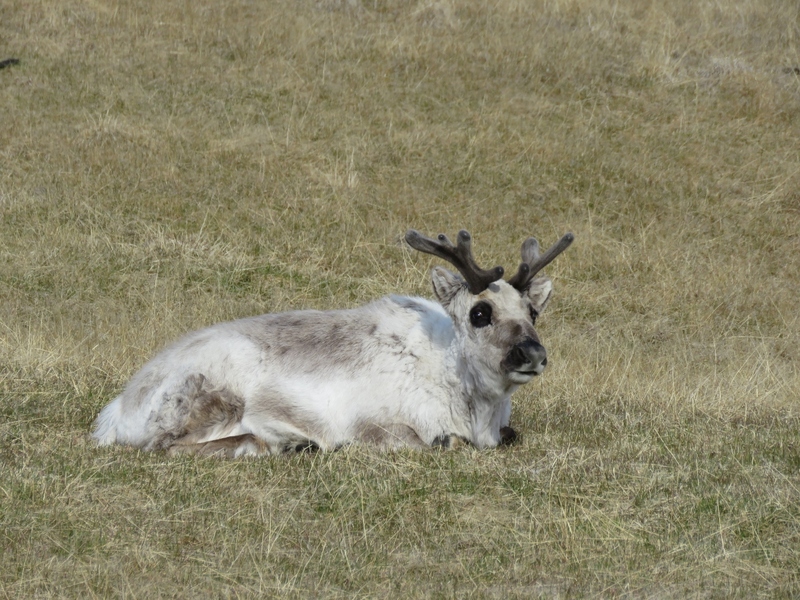 Our Henningsen guide said she would point out any wildlife she saw, except for Reindeer because you can see them everywhere. 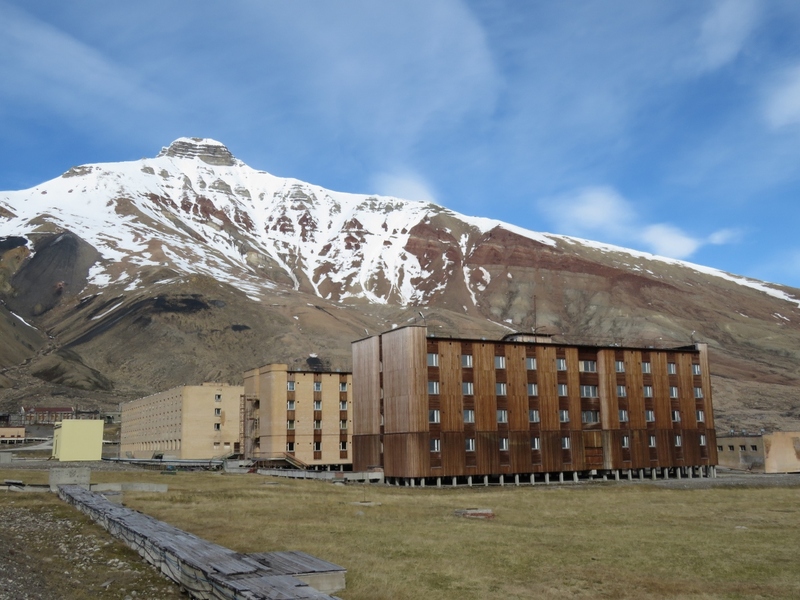 Residents of Pyramiden lived in these apartment blocks segregated for single men, single women and families. 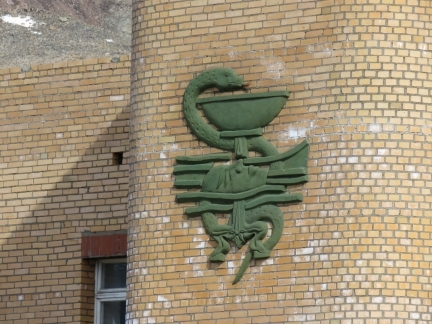 Medical symbol on the hospital at Pyramiden. 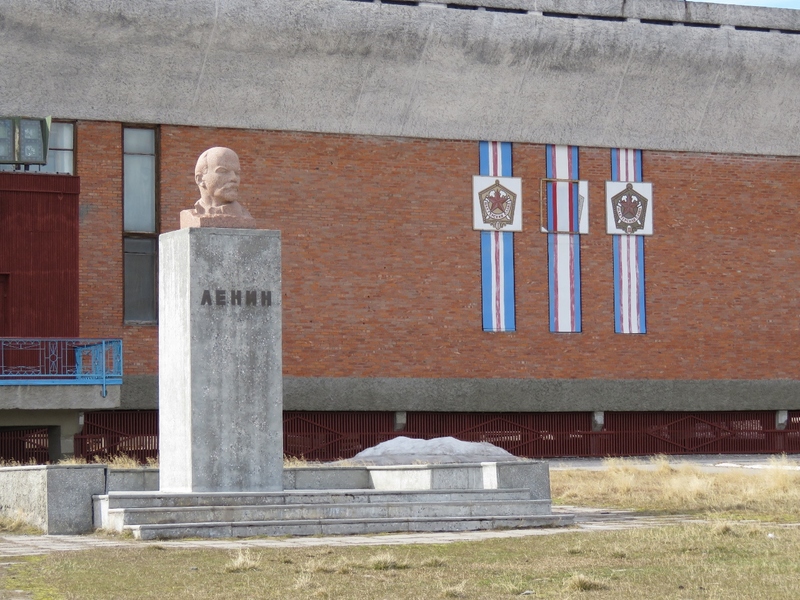 Statue of Lenin outside the Culture House, the main community building in the settlement. 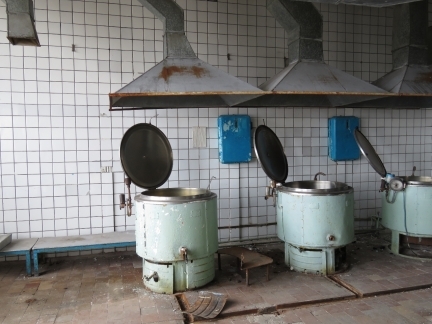 The settlement has been frozen in time since being abandoned in 1998. 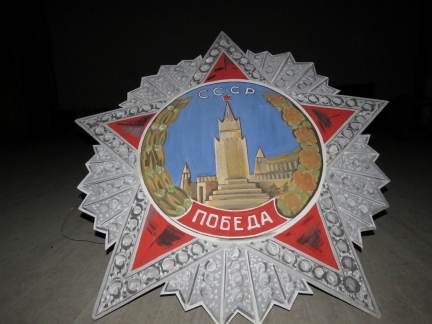 It’s been a while since we’ve seen a CCCP reference. The sports court in the Culture House. In Pyramiden we’re at 79°N, likely the farthest north we’ll ever reach. 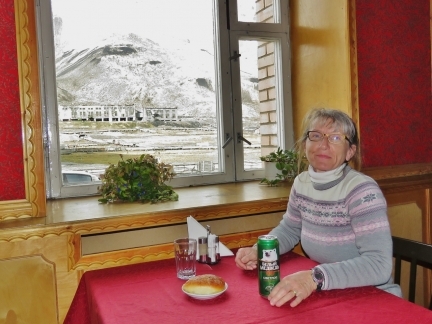 The meals in Pyramiden were all provided by the government. 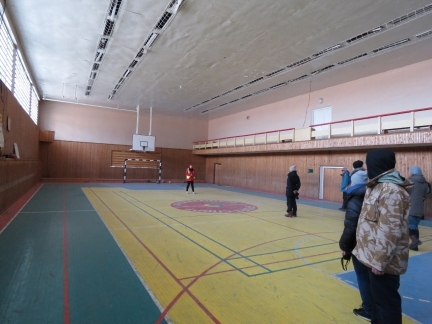 Because the town was one of the few Russian places a foreigner could visit without a visa, the government built it as a showcase of the communist standard of living. Looking across the ghost town of Pyramiden with an old mine shaft heading up the hill on the left. 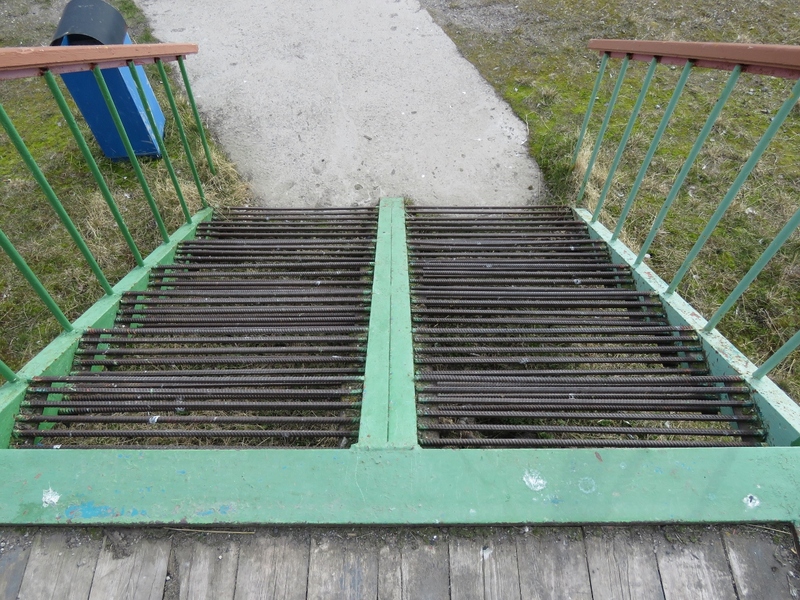 ReBar steps at one of the buildings in Pyramiden. 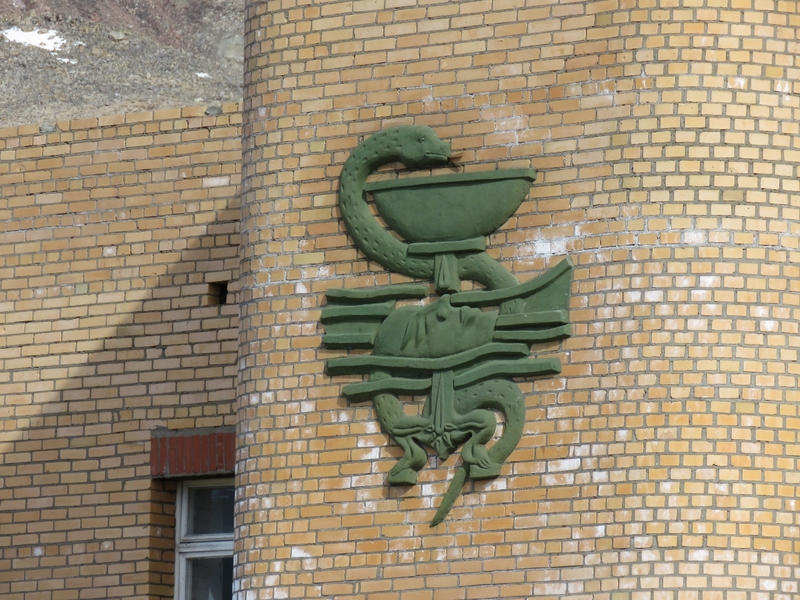 Exposed ReBar is a commmon feature in Pyramiden. Our most northerly beer ever at the re-opened Pyramiden hotel. After our cruise, we had an excellent meal at Huset in Longyearbyen. At Kuhaugen, the base for Svalbard adventure-tour company Better Moments. 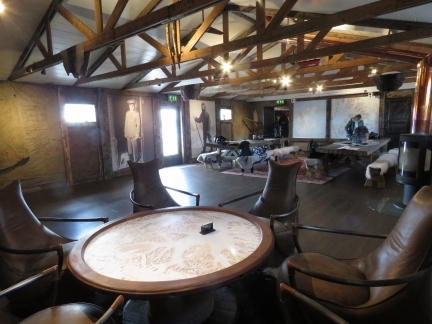 The building is decorated as explorer’s club in the style of the 19th and 20th century polar expeditions. 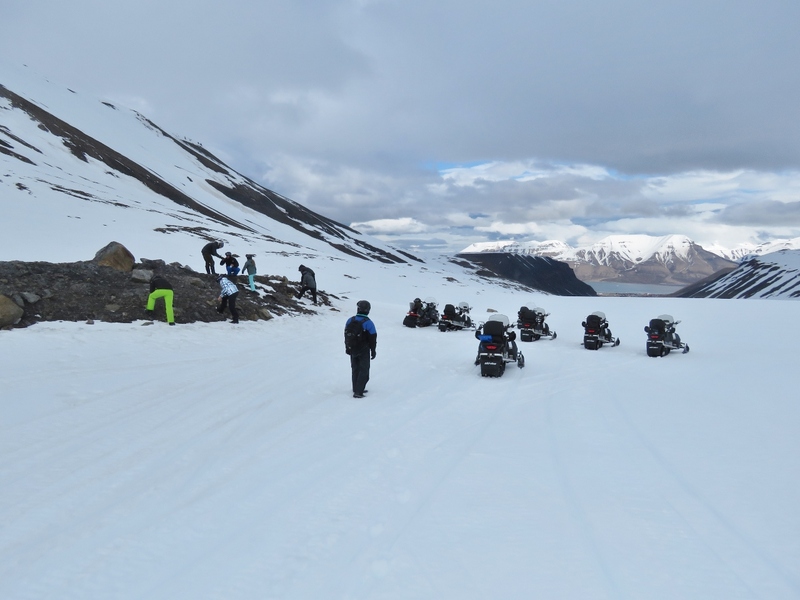 We’re taking a late-season snowmobile trip to Longyear Glacier, but first we have to hike a short distance to reach the snowmobiles. 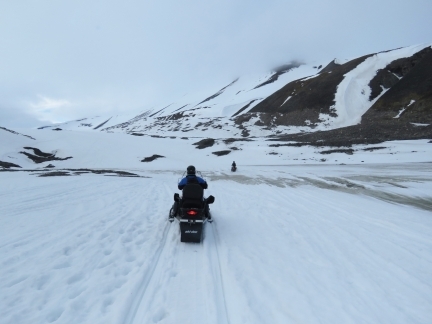 In the winter, you could just ride the snowmobiles right from Kuhaugen. Our guide, Eli Gunnemark, is carrying the requisite rifle for polar bear protection. Jennifer, on the second snowmobile from the left, with the rest of our group. 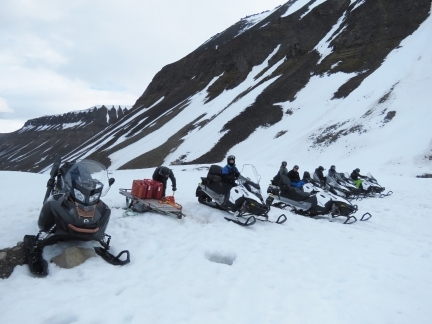 Our guide Eli is topping off the snowmobiles from cans of fuel stashed nearby. 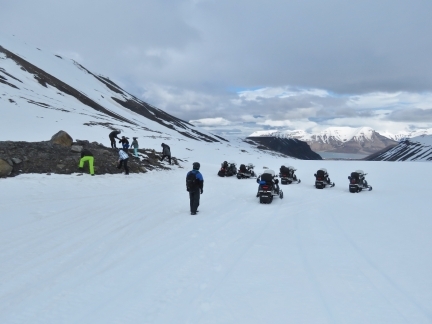 Jennifer about to snowmobile across a small stream, another late-season obstacle to reaching Longyear Glacier. The trick is to go at least 30kph so you don’t sink. 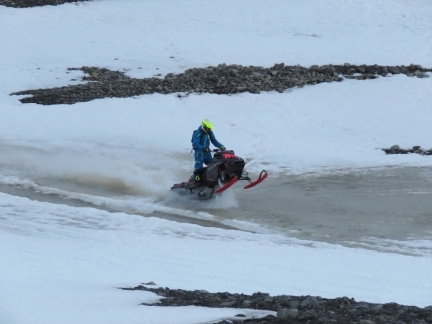 We were reminded somewhat of that crazy eastern-Canadian sport of open-water snowmobile racing. We both crossed the stream without issue, but one of our group found deeper water and tipped their snowmobile. Fortunately nobody was hurt and the snowmobile wasn’t damaged. 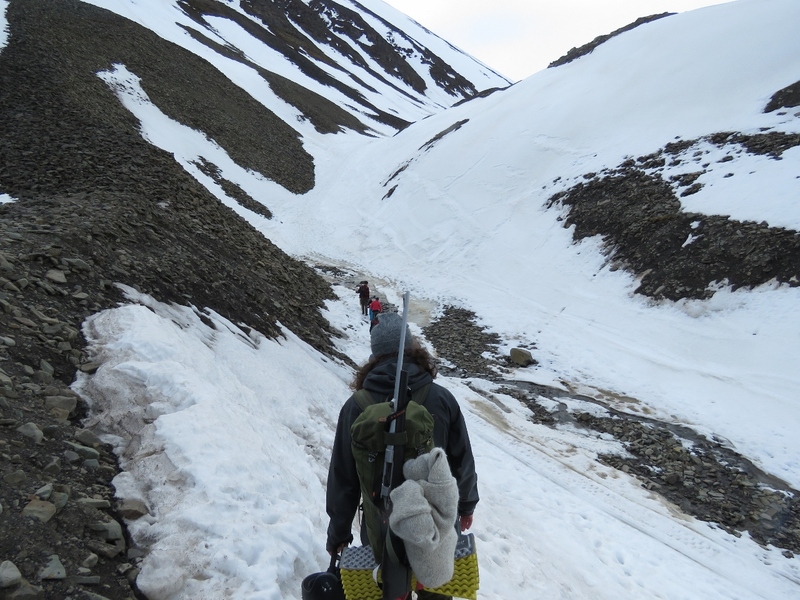 James skidding through a corner on Longyear Glacier. 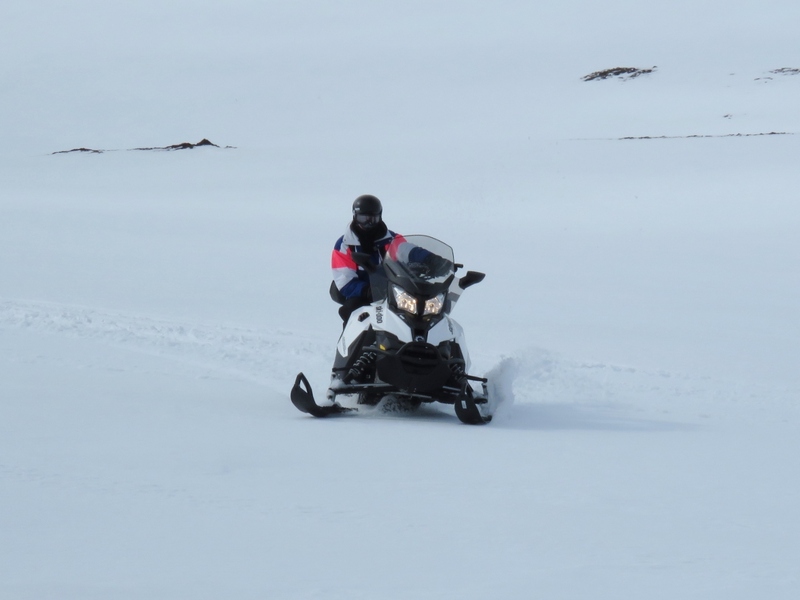 This was our first time snowmobiling and we had a fabulous time. We’re looking forward to trying it again. 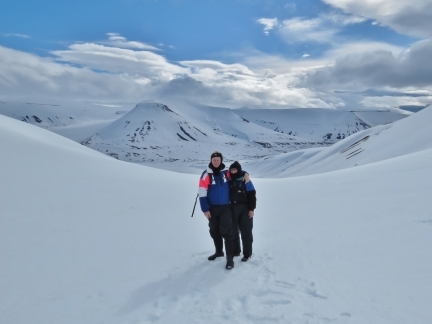 At Longyear Glacier above the beautiful Fardalen valley. 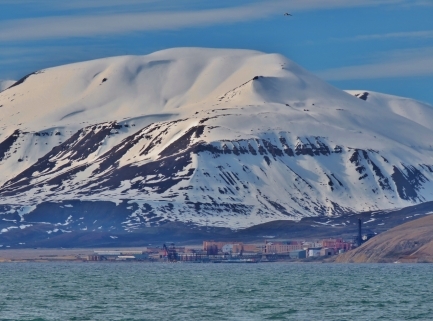 In the winter, you can ride a snowmobile through the canyon to the active Russian mining town of Barentsburg. 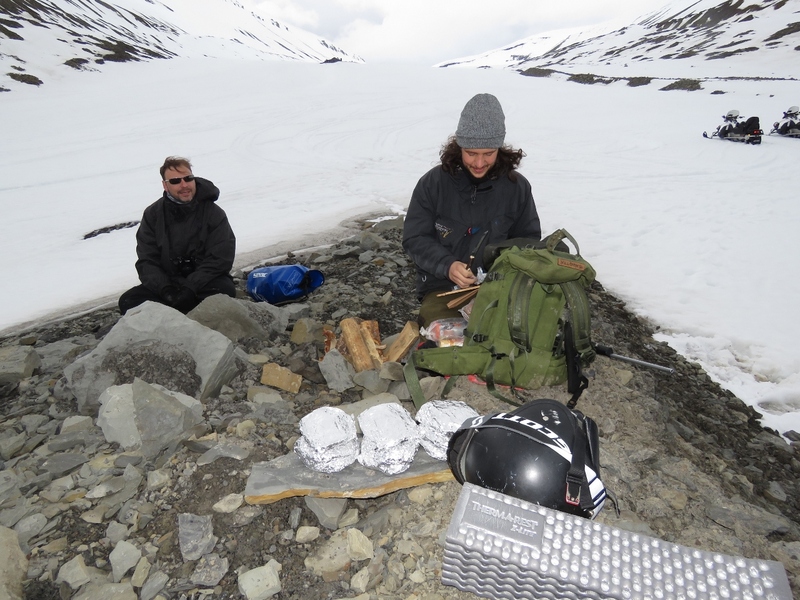 Lunch with a warm fire at the base of Longyear Glacier. Our guide Eli Gunnemark is on the right. The Sons of Svalbard are a local club that repair most of the snowmobiles in the area and obviously have really tricked-out their personal rides. 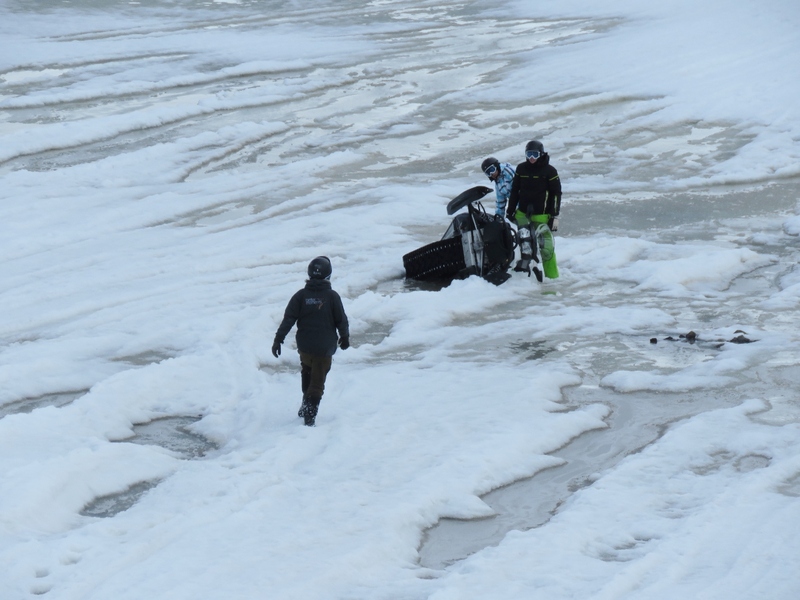 They would fit right in with the open-water snowmobile racers. 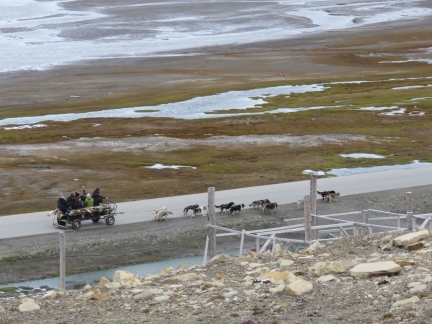 In the summer, tourists can take a wheeled dog-sled tour to a cacophony of barking. 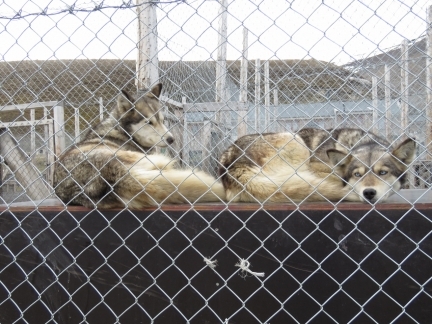 We’re told the huskies enjoy the exercise rather than being cooped up in their pens all summer. 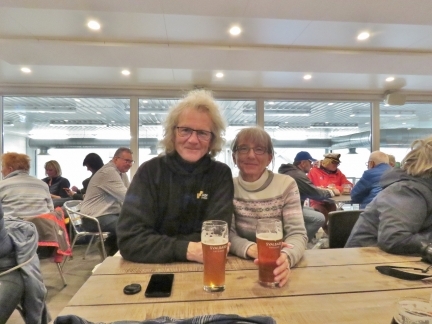 Some of our group had arrived in the cruise ship Meraviglia, so we got dropped off with them at the harbour. 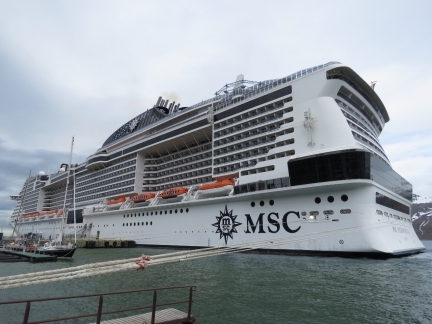 The massive 1,036ft (315 m) Meraviglia can carry up to 4,500 passengers and a crew of 1,536. Longyearben’s population today rose from 2,144 to 8,180, not including all the other visitors. The reason we’d been dropped off at the harbour was to stop by the adjacent Svalbard Brewery, the world’s most northerly micro-brewery. Vats at the Svalbard Brewery. 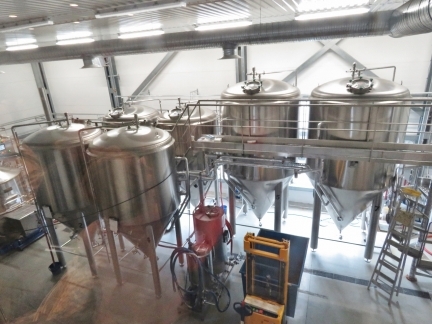 The brewery wasn’t doing tours because the cruise ship was in town. But they were open more extended hours that normal, otherwise we’d not have been able to visit. 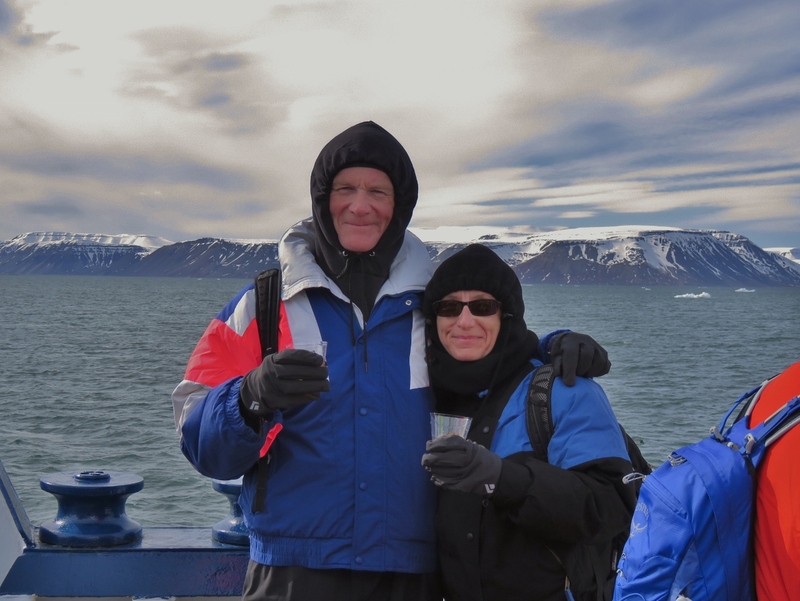 Enjoying our most northerly microbrew at Svalbard Brewery. This has got to be the third or fourth time we’ve been in the world’s northernmost microbrewery as we’ve travelled north. :) But at 78° north, this one has to have the title. From the brewery, we walked back east toward the husky pens. Here Jennifer is petting a friendly Husky who is guarding the local ducks from fox attacks. Hundreds of nesting ducks were near the Husky pens. 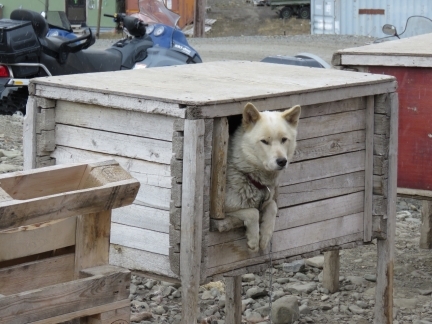 The sled dogs are beautiful animals. The cruise ship Meraviglia towers over the town and nearly overwhelms it by disgorging twice the local population. 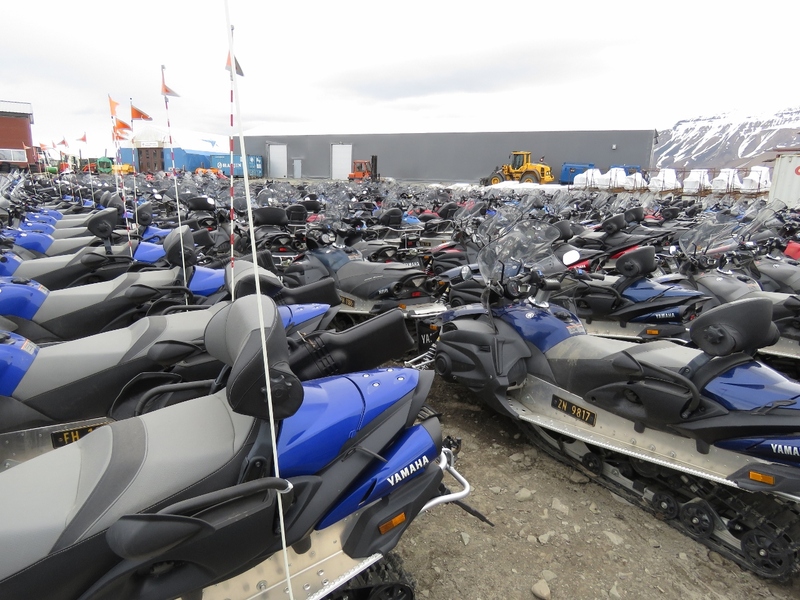 Longyearbyen has literally thousands of snowmobiles. 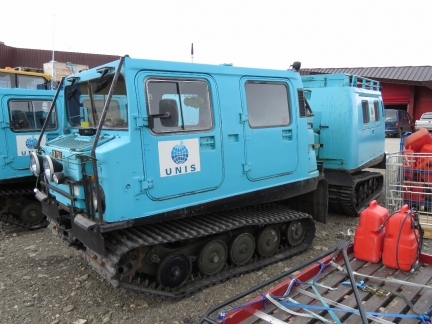 These ones are parked in a reasonably organized fashion, but many look abandoned in place. Most have keys in the ignition, in case someone needs to escape from a polar bear. 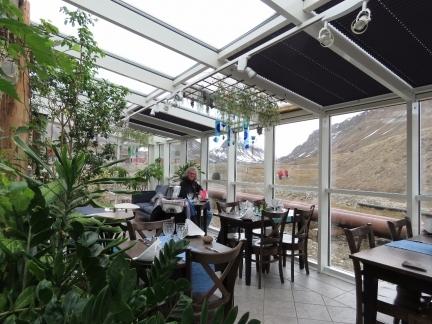 We had a nice dinner at the delightful tropical-plant-filled Winter Garden restaurant with a view southeast to Longyearbyen. 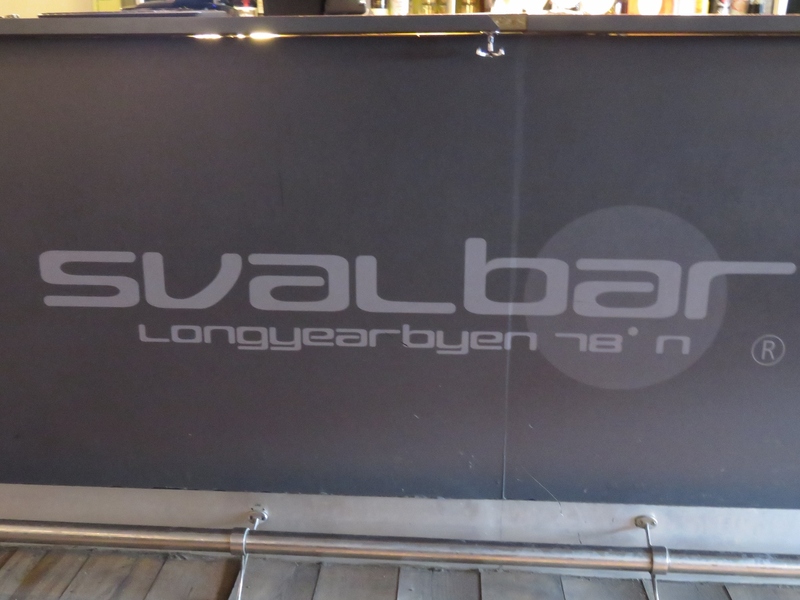 We couldn’t resist finishing the day with a drink at Svalbar beside our hotel. 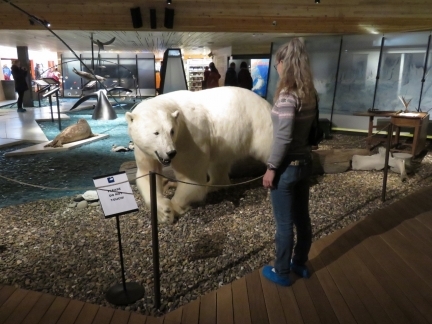 We really enjoyed the Svalbard Museum in Longyearbyen. 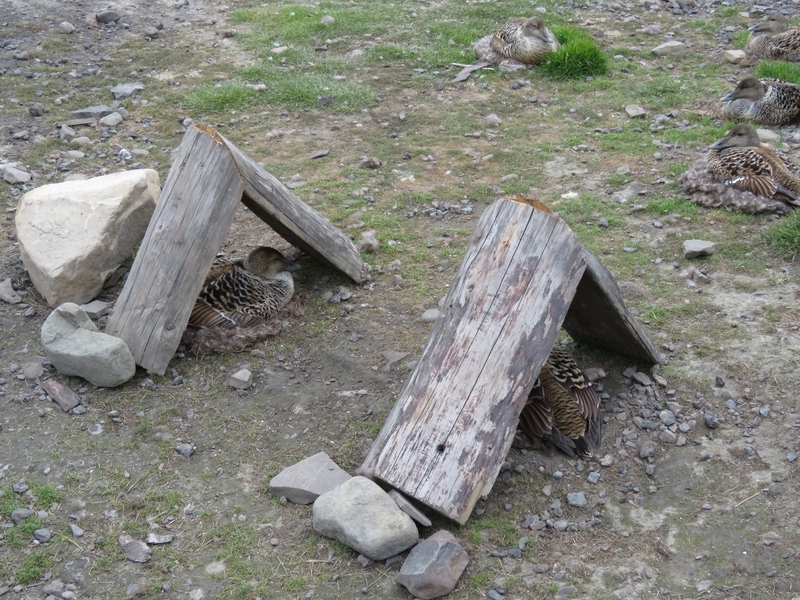 The displays were excellent, with good explanations. Note Jennifer is wearing museum-supplied booties as outdoor shoes aren’t allowed in the museum. 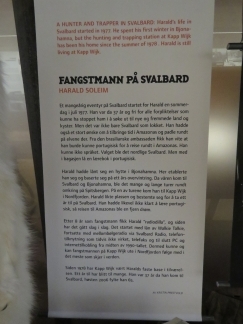 The museum had interpretive signs in both English and Norwegian, with some quite different in length between the languages. 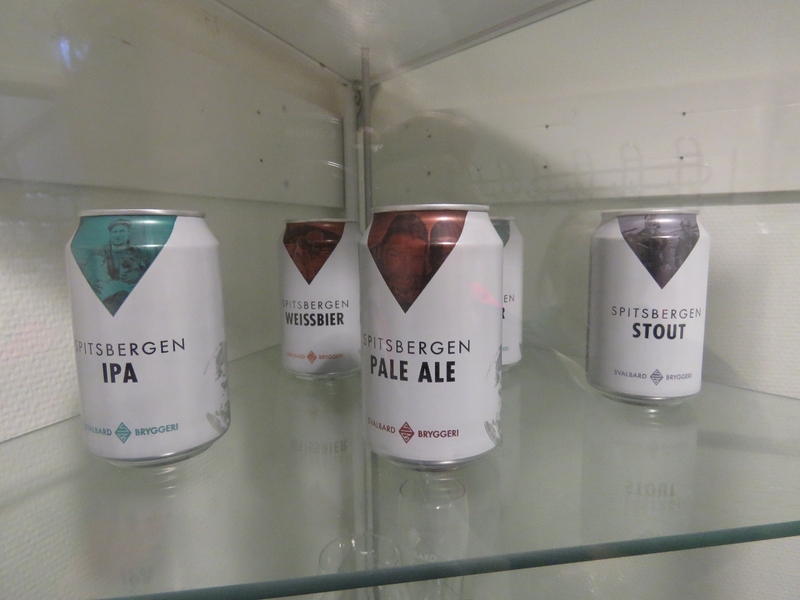 We were a little suspicious that Norwegian couldn’t possibly be that much more wordy than English though. 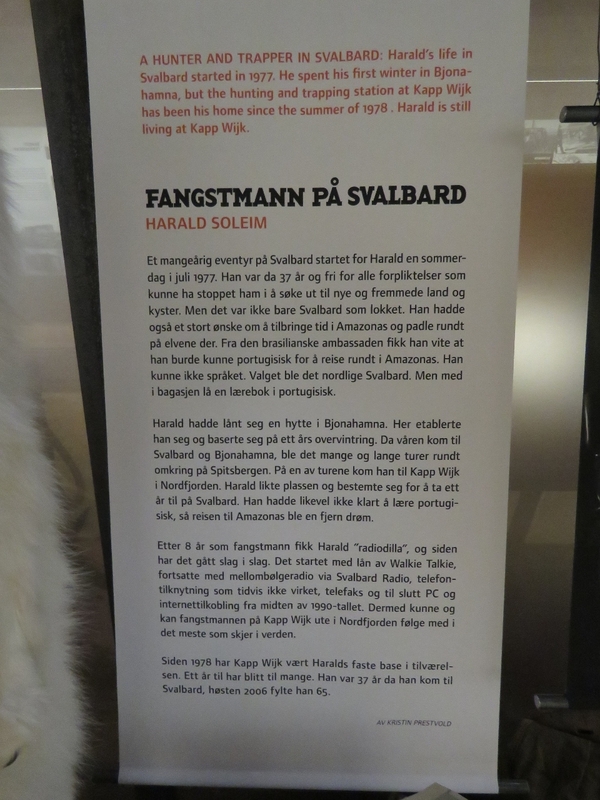 Our suspicion was confirmed at a display where our snowmobile guide Eli had told us the full story, but the English version skipped most of the detail. 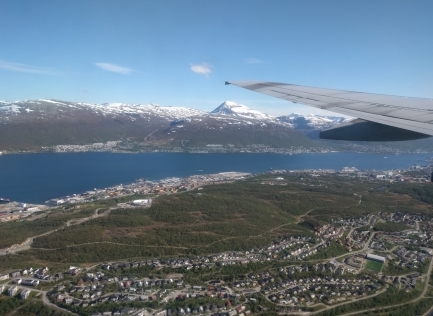 The view over Tromsø as we arrive on our return flight from Svalbard. Our marina is just out of the picture on the top right of the photo. That fingerpost photo strikes me with its set of numbers. Those distances are on the order of magnitude of the radius of the whole planet – the entire world. And yet, here we are just casually pointing, traveling, maybe thinking it’s no big deal. Just a few thousand kilometers, over that way. The world is damn small. It’s true Frank. Air travel changes everything. Svalbard is only 650 miles from the North Pole and yet 100’s visit it every day from all over the world. I’ve always wanted to go to Svalbard and I was wondering if you were going to make a stop. Looks like an amazing place. 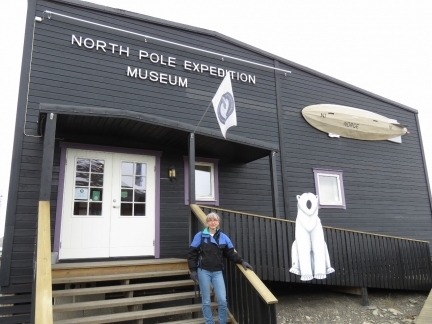 It was a pretty cool experience … only 600 miles from the North Pole.